We are fortunate enough to be the Illinois leg of the Saints and Sinners Tour put on by Banned Booking, previously in Iowa and Missouri! Featuring artists that have all played our Johnny & June's stage! NOW is your chance to see them all together in one night! This past January you saw Jake Stringer and Better Than Nothin' open for Porter Union. 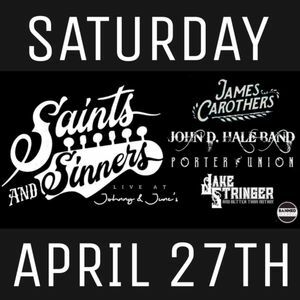 In January 2018 we were graced with John D. Hale Band in support of the James Carother's Band. Most of you have seen James one time or another at Johnny & June's! The venue will be set up with chairs along the outside and a huge dance floor for all you two-steppers and line dancers! It's going to be a GREAT night of up-and-coming Johnny & June's Spotlight Artists! A food vendor will be available for purchase. You must be 21 to enter. Be prepared to show valid ID. No outside food or drinks will be permitted. Bags and purses may be subject to a search. For handicap or special circumstances call Johnny & June's IN ADVANCE at 618-662-0802, or email Kathy@JohnnyJunes.com. No refunds/exchanges will be allowed. Tickets are subject to change. You can bring your printed ticket, or if you bring your phone with your tickets on them we can scan those as well.